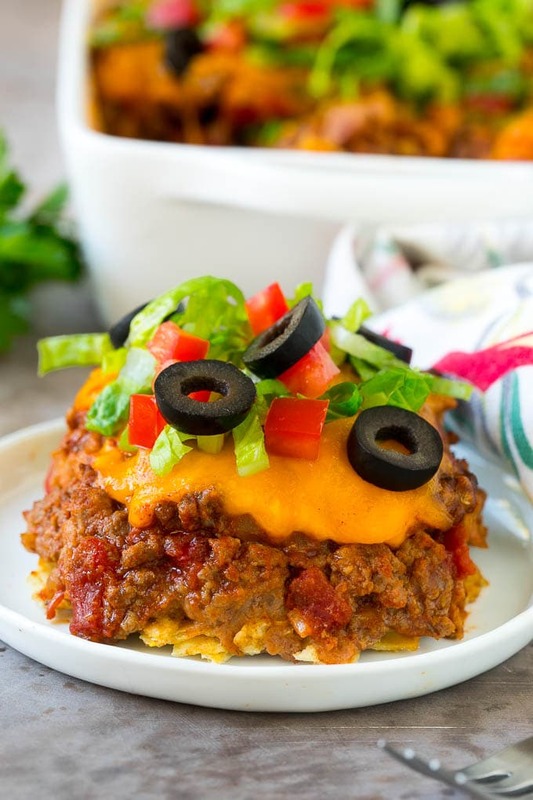 This taco casserole is layers of tortilla chips, refried beans and beef, all topped with plenty of cheese and baked to perfection. Add your favorite taco fixings such as lettuce, tomato and olives for a hearty and family friendly meal! 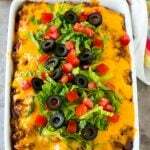 My family loves a hot cheesy casserole, they’re always requesting beef noodle casserole, chicken and rice casserole and this festive taco casserole. You can never go wrong with tacos! 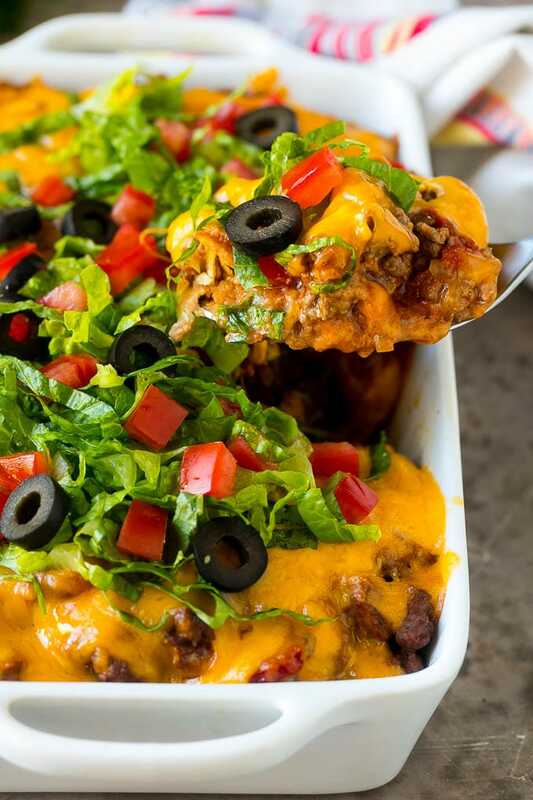 I love to do taco night for dinner, but sometimes when I’m in a hurry, I just layer all the ingredients in a dish and bake them together, which is how this taco casserole came to be. This recipe has all of the components of tacos in the form of a cheesy casserole. You can even add your favorite taco fixings on top to take this dish to the next level! 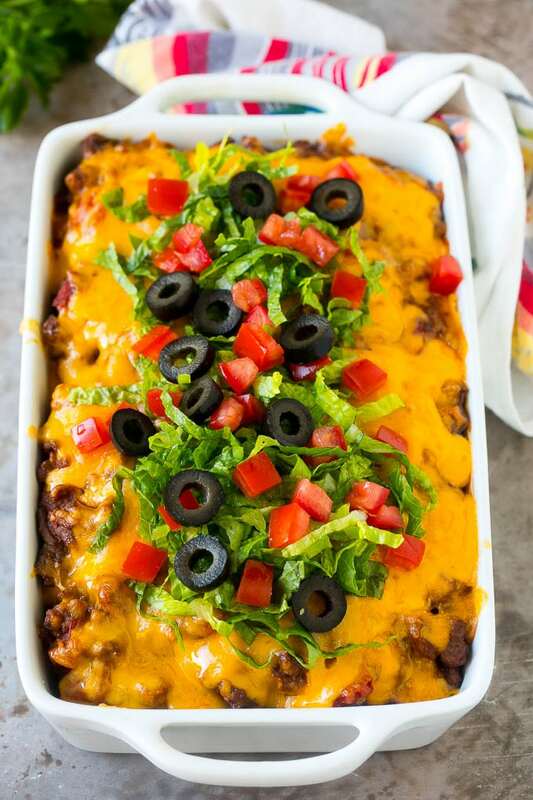 How do you make taco casserole? 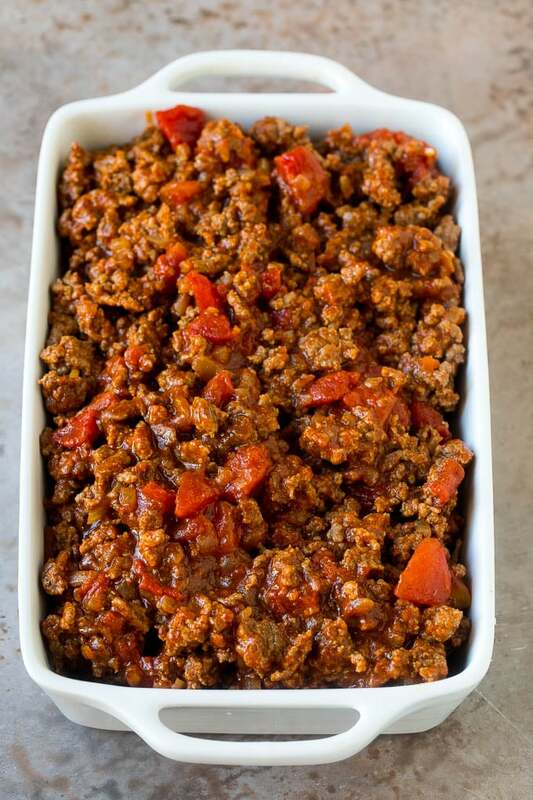 This recipe starts with ground beef, which is cooked in a skillet with onions, tomatoes and taco seasoning. 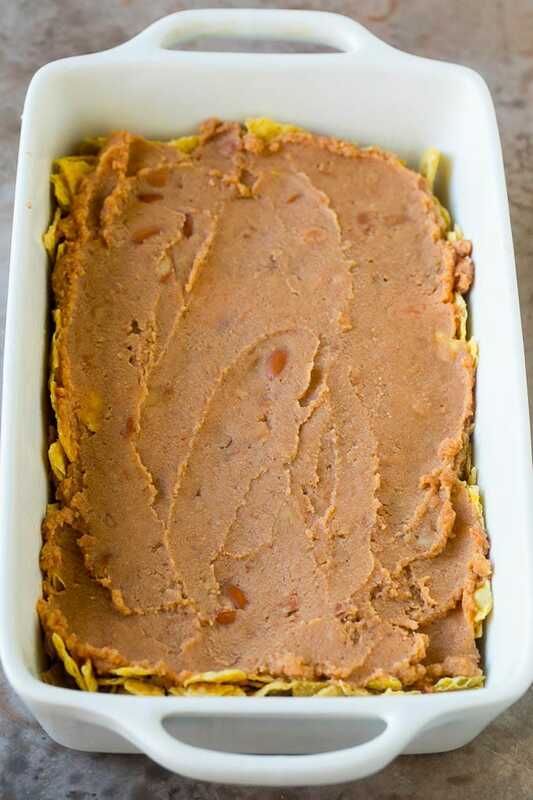 A layer of crushed tortilla chips goes into the bottom of a casserole dish, and is topped with refried beans. The next step is to add your layer of beef, and plenty of shredded cheese. Bake your casserole until it’s bubbling and the cheese is melted, then add some fresh toppings and serve. I typically use 90% lean ground beef, it has plenty of flavor but is not overly greasy. I recommend grating your own cheese instead of using the pre-shredded variety. The bagged grated cheese is often coated with anti caking agents and does not melt as well as freshly shredded cheese. This dish can easily be doubled for a crowd and makes for great leftovers. To crush your tortilla chips, place them in a resealable bag and use a rolling pin or meat mallet. You want your chips to be coarsely crushed, about 1/4 inch sized pieces. There are so many different ways to customize this casserole to your tastes. Protein: Use cooked diced chicken or ground turkey instead of beef. Cheese: Try pepper jack instead of cheddar for a bit of a spicy kick. 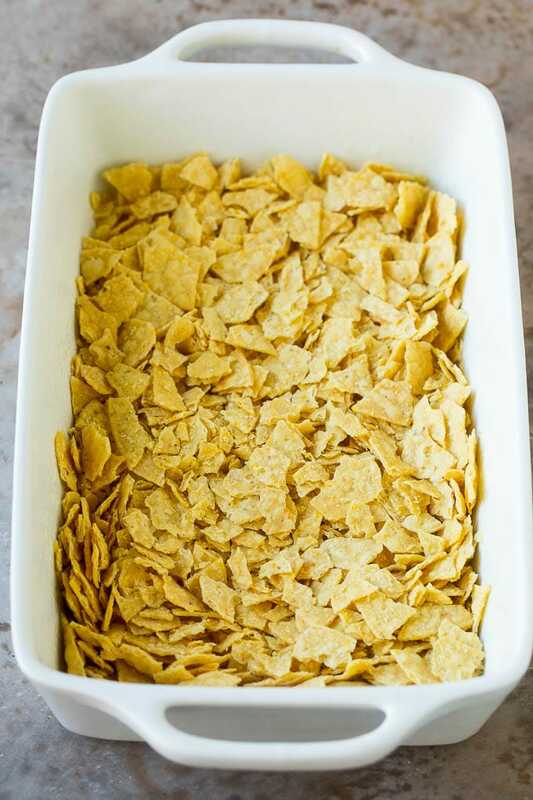 Chips: Instead of regular tortilla chips, try a flavored chip such as nacho cheese chips, or you can use a layer of flour or corn tortillas on the bottom. Beans: Use black or pinto beans instead of refried beans. Vegetables: You can add extra vegetables to your beef mixture such as bell peppers or corn. Toppings: You can top your casserole with sour cream, avocado, more crushed chips, pickled jalapenos, green onions or cilantro. 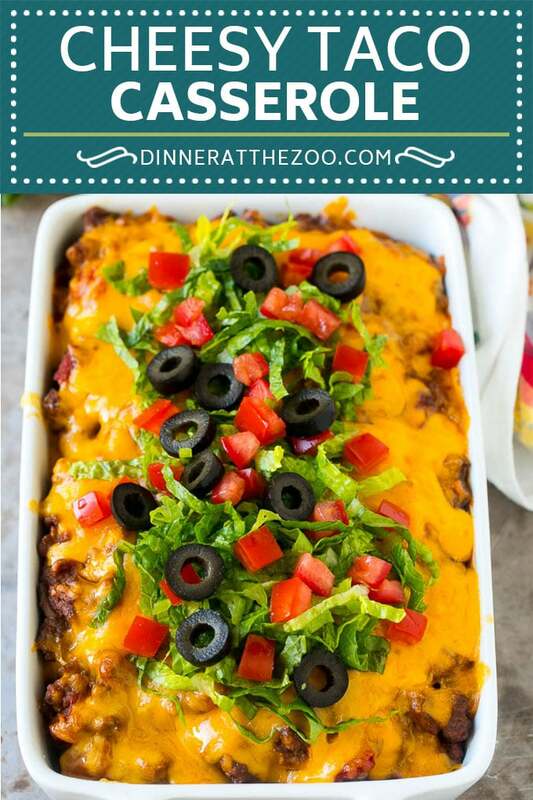 This casserole is such a fun and easy way to do taco night. 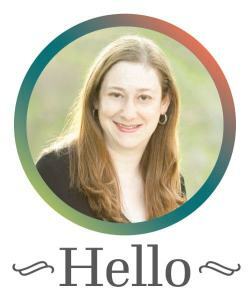 I find myself making it on a regular basis because my kids can’t get enough of it! Add some steamed vegetables on the side and you’ll have a dinner that will earn you rave reviews. Preheat the oven to 350 degrees F. Coat a 9 inch square pan or 2 quart baking dish with cooking spray. Heat the olive oil in a large pan over medium high heat. Add the ground beef and cook for 5-6 minutes, breaking up the meat with a spatula. Add the onion and cook for an additional 3-4 minutes or until onion is translucent. Stir in the taco seasoning and diced tomatoes. Simmer for 3-4 minutes. Place a layer of tortilla chips in the bottom of the prepared pan. Spread a layer of refried beans over the top. Pour the beef mixture over the beans and top with the cheese. Add toppings if desired, then serve. Tried this with ground chicken, added a dollop of guacamole and used low carb tortillas for an excellent Taco Tuesday meal. For my carb conscious guests, it hit the spot! This will quickly become a favorite in our house! Can’t wait to dive into this! Love all the flavors going on and I’m so excited to make this! This looks like my kinda dinner, I love Mexican! I love taco everything! I am sure I will love this recipe! WOW!! This looks incredible!! I bet it tastes ahhmaazing!! YUM!! This sounds delish. We are going to party in a couple of weeks and i am taking this cass for sure! I will be adding this to my dinner line up for the week! This looks amazing!